Let's face it, we could all do with a really good laugh sometimes! And more and more research is showing just how good laughter is for us - mind, body and spirit., A Shinetime laughter workshop is designed to help participants discover and really experience all the many benefits of laughter in the best way possible - by laughing! 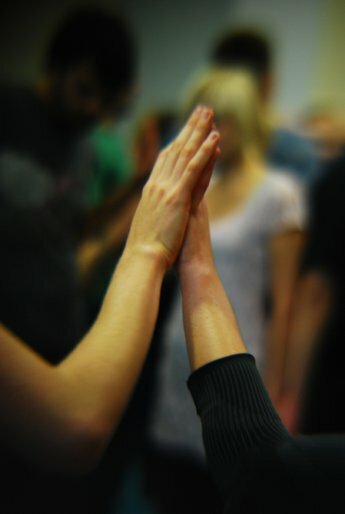 Participants will leave relaxed, refreshed and energised, having learnt valuable laughter yoga exercises and techniques that they can use again and again and again to generate laughter for themselves- whenever they need a laughter boost! You don't need to be feeling happy, you don't even need a sense of humour for a workshop to be enormously transformational! People often comment that they don't remember the last time they laughed so much. We give you the tools to be able to laugh more easily and regularly. A tremendously uplifting and powerful experience, with lasting effects. Workshops are always fully tailored to your group's objectives and needs. We've laughed in all sorts of settings and with all sorts of organisations - with businesses, charities, conferences big and small, groups, care homes, parties and schools. From short conference energisers to longer team-building or wellbeing focused workshops, LAUGHTER WORKS. Please drop us a line to talk through your requirements and see below for more information about the many applications of laughter! We'd love to laugh with you! "Mistress of Merriment and Mirth Leela Bunce showed us you don't have to be happy to laugh, you can laugh to be happy - and it works, I promise!" Chris Evans. "Leela was lovely when she came on our show..she is infectious with her laughter." More and more research is confirming that laughter needs to be taken very seriously! Laughter has been shown to be enormously beneficial - for mind, body and spirit. "Everything looks better after a good laugh"
A good hearty laugh helps bring you into balance - reducing stress hormones, pain and tension, promoting relaxation of the whole body and aiding healing. Laughter boosts the immune system, increasing immune cells and infection fighting antibodies, as well as triggering the release of endorphins - the body's "feel-good", pain-relieving chemica. Laughing also promotes better circulation, respiration and wellbeing - helping you to de-stress, relax and recharge. Laughter encourages positivity and a more optimistic attitude, greater connection with others, enhances resilience, playfulness and enthusiasm. Team bonds and confidence get a lovely boost after a good laugh. In short, laughter is great for physical, mental and emotional wellbeing! Our aim is to provide people with the tools to be able to laugh whenever they choose and to really enjoy all the benefits of a good laugh! Shinetime’s Leela Bunce was very pleased to be the laughter expert for BBC One’s experimental series The Science of the Young Ones, in an exciting laughter experiment run in conjunction with the University of Westminster and overseen by presenter Dr Michael Mosley. Blood tests taken before and after a laughter workshop with Leela showed that laughter dramatically reduced the stress hormone cortisol! © www.shinetime.co.uk 2016 All rights reserved.